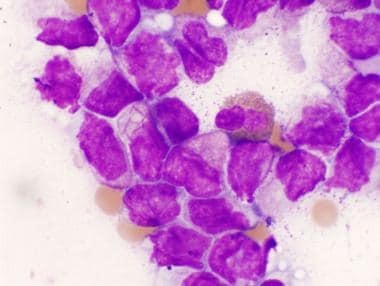 Acute promyelocytic leukemia (APL) is a is a unique subtype of acute leukemia characterized by abnormal proliferation of promyelocytes, life-threatening coagulopathy, and the chromosome translocation t(15;17)(q22;q11-12). The discovery and elucidation of the molecular pathogenesis for APL has led to the introduction of all-trans retinoic acid (ATRA) and arsenic trioxide (ATO) therapies, which improved the prognosis of APL patients significantly. 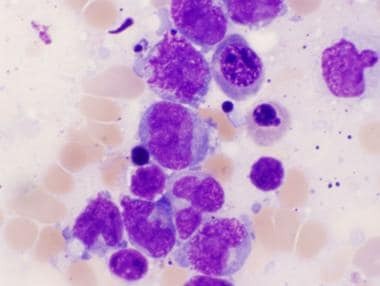 Hypogranular subtype of acute promyelocytic leukemia. Image courtesy of Dr. William Kocher. Regularly hypergranular subtype of acute promyelocytic leukemia. Image courtesy of Dr. William Kocher. For patient education information, see the Cancer Center, as well as Leukemia. In addition, patients should visit the Leukemia and Lymphoma Society Web page, www.leukemia-lymphoma.org, for further information. APL was first described as an entity in the late 1950s in Norway and France as a hyperacute fatal illness associated with a hemorrhagic syndrome. In 1959, Jean Bernard et al described the association of APL with a severe hemorrhagic diathesis that led to disseminated intravascular coagulation (DIC) and hyperfibrinolysis. By 1973, there were reports of complete remissions with treatment of the disease by daunorubicin. Acute promyelocytic leukemia (APL) is defined by its cytogenetic properties. Over 95% of cases are characterized by a balanced translocation between chromosome 17q21 and chromosome 15q22. This leads to an abnormal fusion protein called PML-RARA. This translocation can be detected by karyotyping or fluorescence in situ hybridization (FISH) studies, and the transcript can be detected by polymerase chain reaction (PCR) techniques. The retinoic acid alpha receptor gene (RARA) is encoded by the long arm of chromosome 17. It is mainly expressed in hematopoietic cells and has an important role in regulating gene expression. In the absence of retinoid acid, RARA is bound by nuclear corepressor factor, and this causes transcriptional repression. In the presence of retinoic acid, RARA is activated and terminal differentiation of promyelocytes occurs. The promyelocytic gene (PML) is encoded by the long arm of chromosome 15 and is expressed ubiquitously. PML is thought to be involved in apoptosis and tumor suppression. About 40% of APL cases also express additional chromosomal abnormalities (trisomy 8 and isochromosome 17). These do not appear to impact the overall prognosis. In the United States, acute promyelocytic leukemia (APL) accounts for 5-15% of all adult leukemias. Approximately 30,800 cases of acute leukemia are diagnosed yearly in the US, and about 1000 of those are APL. The annual incidence of APL in Italy is approximately 0.6 per 1 million people. The incidence of APL in males and females is equal. The median age of onset of APL is about age 40 years. Since the early 1990s, there have been reports of extramedullary relapse to the skin and central nervous system with APL that are associated with a poor prognosis. Bernard J. History of promyelocytic leukaemia. Leukemia. 1994. 8 suppl 2:S1-5. [Medline]. Lo-Coco F, Cicconi L, Voso MT. Progress and criticalities in the management of acute promyelocytic leukemia. Oncotarget. 2017 Nov 21. 8 (59):99221-99222. [Medline]. [Full Text]. Vahdat L, Maslak P, Miller WH Jr, et al. Early mortality and the retinoic acid syndrome in acute promyelocytic leukemia: impact of leukocytosis, low-dose chemotherapy, PMN/RAR-alpha isoform, and CD13 expression in patients treated with all-trans retinoic acid. Blood. 1994 Dec 1. 84(11):3843-9. [Medline]. [Full Text]. Yin CC, Jain N, Mehrotra M, Zhagn J, Protopopov A, Zuo Z, et al. Identification of a novel fusion gene, IRF2BP2-RARA, in acute promyelocytic leukemia. J Natl Compr Canc Netw. 2015 Jan. 13(1):19-22. [Medline]. Cao Y, Yuan R, Wang Y, Chen R, Huang M, Zhou J. A New Chromosome Translocation t(7;16)(q31,q22) Change during an Acute Promyelocytic Leukemia Relapse. Cytogenet Genome Res. 2013 May 4. [Medline]. Jurcic JG, Soignet SL, Maslak AP. Diagnosis and treatment of acute promyelocytic leukemia. Curr Oncol Rep. 2007 Sep. 9(5):337-44. [Medline]. Ribeiro RC, Rego E. Management of APL in developing countries: epidemiology, challenges and opportunities for international collaboration. Hematology Am Soc Hematol Educ Program. 2006. 162-8. [Medline]. [Full Text]. Douer D. The epidemiology of acute promyelocytic leukaemia. Best Pract Res Clin Haematol. 2003 Sep. 16(3):357-67. [Medline]. Matasar MJ, Ritchie EK, Consedine N, Magai C, Neugut AI. Incidence rates of acute promyelocytic leukemia among Hispanics, blacks, Asians, and non-Hispanic whites in the United States. Eur J Cancer Prev. 2006 Aug. 15(4):367-70. [Medline]. Cicconi L, Lo-Coco F. Current management of newly diagnosed acute promyelocytic leukemia. Ann Oncol. 2016 Aug. 27 (8):1474-81. [Medline]. [Full Text]. Xu F, Wang C, Yin C, Jiang X, Jiang L, Wang Z, et al. Analysis of early death in newly diagnosed acute promyelocytic leukemia patients. Medicine (Baltimore). 2017 Dec. 96 (51):e9324. [Medline]. [Full Text]. Hou J, Wang S, Zhang Y, Fan D, Li H, Yang Y, et al. Causes and prognostic factors for early death in patients with acute promyelocytic leukemia treated with single-agent arsenic trioxide. Ann Hematol. 2017 Dec. 96 (12):2005-2013. [Medline]. Zhao H, Zhao Y, Zhang Y, Hou J, Yang H, Cao F, et al. Difference in causes and prognostic factors of early death between cohorts with de novo and relapsed acute promyelocytic leukemia. Ann Hematol. 2018 Mar. 97 (3):409-416. [Medline]. [Guideline] National Comprehensive Cancer Network. Acute Myeloid Leukemia. NCCN. Available at http://www.nccn.org/professionals/physician_gls/pdf/aml.pdf. Version 1.2018 — February 7, 2018; Accessed: February 28, 2018. Testa U, Lo-Coco F. Prognostic factors in acute promyelocytic leukemia: strategies to define high-risk patients. Ann Hematol. 2016 Apr. 95 (5):673-80. [Medline]. Tallman MS, Kim HT, Montesinos P, et al. Does microgranular variant morphology of acute promyelocytic leukemia independently predict a less favorable outcome compared with classical M3 APL? A joint study of the North American Intergroup and the PETHEMA Group. Blood. 2010 Dec 16. 116(25):5650-9. [Medline]. Montesinos P, González JD, González J, Rayón C, de Lisa E, Amigo ML, et al. Therapy-related myeloid neoplasms in patients with acute promyelocytic leukemia treated with all-trans-retinoic Acid and anthracycline-based chemotherapy. J Clin Oncol. 2010 Aug 20. 28(24):3872-9. [Medline]. Cashen AF. Acute Leukemias. Govindan R, Morgensztern D, eds. DeVita, Hellman, and Rosenberg's Cancer: Principles & Practice of Oncology: Review. 4th ed. Philadelphia, Pa: Wolters Kluwer; 2016. 293-304. Menell JS, Cesarman GM, Jacovina AT, et al. Annexin II and bleeding in acute promyelocytic leukemia. N Engl J Med. 1999 Apr 1. 340(13):994-1004. [Medline]. [Full Text]. Tallman MS, Andersen JW, Schiffer CA, et al. All-trans retinoic acid in acute promyelocytic leukemia: long-term outcome and prognostic factor analysis from the North American Intergroup protocol. Blood. 2002 Dec 15. 100(13):4298-302. [Medline]. [Full Text]. Shigeno K, Naito K, Sahara N, et al. Arsenic trioxide therapy in relapsed or refractory Japanese patients with acute promyelocytic leukemia: updated outcomes of the phase II study and postremission therapies. Int J Hematol. 2005 Oct. 82(3):224-9. [Medline]. Shen ZX, Shi ZZ, Fang J, Gu BW, Li JM, Zhu YM, et al. All-trans retinoic acid/As2O3 combination yields a high quality remission and survival in newly diagnosed acute promyelocytic leukemia. Proc Natl Acad Sci U S A. 2004 Apr 13. 101(15):5328-35. [Medline]. [Full Text]. Lo-Coco F, Avvisati G, Vignetti M, Thiede C, Orlando SM, Iacobelli S, et al. Retinoic acid and arsenic trioxide for acute promyelocytic leukemia. N Engl J Med. 2013 Jul 11. 369(2):111-21. [Medline]. [Full Text]. Sanz MA, Martin G, Gonzalez M, et al, for the Programa de Estudio y Traitmiento de las Hemopatias Malignas. Risk-adapted treatment of acute promyelocytic leukemia with all-trans-retinoic acid and anthracycline monochemotherapy: a multicenter study by the PETHEMA group. Blood. 2004 Feb 15. 103(4):1237-43. [Medline]. [Full Text]. Fenaux P, Chastang C, Chevret S, et al, for the The European APL Group. A randomized comparison of all transretinoic acid (ATRA) followed by chemotherapy and ATRA plus chemotherapy and the role of maintenance therapy in newly diagnosed acute promyelocytic leukemia. Blood. 1999 Aug 15. 94(4):1192-200. [Medline]. [Full Text]. Sanz MA, Lo Coco F, Martin G, et al. Definition of relapse risk and role of nonanthracycline drugs for consolidation in patients with acute promyelocytic leukemia: a joint study of the PETHEMA and GIMEMA cooperative groups. Blood. 2000 Aug 15. 96(4):1247-53. [Medline]. [Full Text]. Ades L, Sanz MA, Chevret S, et al. Treatment of newly diagnosed acute promyelocytic leukemia (APL): a comparison of French-Belgian-Swiss and PETHEMA results. Blood. 2008 Feb 1. 111(3):1078-84. [Medline]. [Full Text]. de la Serna J, Montesinos P, Vellenga E, et al. Causes and prognostic factors of remission induction failure in patients with acute promyelocytic leukemia treated with all-trans retinoic acid and idarubicin. Blood. 2008 Apr 1. 111(7):3395-402. [Medline]. [Full Text]. Montesinos P, Gonzalez JD, Gonzalez J, et al. Therapy-related myeloid neoplasms in patients with acute promyelocytic leukemia treated with all-trans-retinoic Acid and anthracycline-based chemotherapy. J Clin Oncol. 2010 Aug 20. 28(24):3872-9. [Medline]. Powell BL, Moser B, Stock W, Gallagher RE, Willman CL, Stone RM, et al. Arsenic trioxide improves event-free and overall survival for adults with acute promyelocytic leukemia: North American Leukemia Intergroup Study C9710. Blood. 2010 Nov 11. 116(19):3751-7. [Medline]. [Full Text]. Avvisati G, Lo-Coco F, Paoloni FP, et al. AIDA 0493 protocol for newly diagnosed acute promyelocytic leukemia: very long-term results and role of maintenance. Blood. 2011 May 5. 117(18):4716-25. [Medline]. Falchi L, Verstovsek S, Ravandi-Kashani F, Kantarjian HM. The evolution of arsenic in the treatment of acute promyelocytic leukemia and other myeloid neoplasms: Moving toward an effective oral, outpatient therapy. Cancer. 2016 Apr 15. 122 (8):1160-8. [Medline]. Soignet SL, Frankel SR, Douer D, et al. United States multicenter study of arsenic trioxide in relapsed acute promyelocytic leukemia. J Clin Oncol. 2001 Sep 15. 19(18):3852-60. [Medline]. [Full Text]. Mathews V, George B, Chendamarai E, Lakshmi KM, Desire S, Balasubramanian P, et al. Single-agent arsenic trioxide in the treatment of newly diagnosed acute promyelocytic leukemia: long-term follow-up data. J Clin Oncol. 2010 Aug 20. 28(24):3866-71. [Medline]. Tomita A, Kiyoi H, Naoe T. Mechanisms of action and resistance to all-trans retinoic acid (ATRA) and arsenic trioxide (As2O 3) in acute promyelocytic leukemia. Int J Hematol. 2013 May 14. [Medline]. Lo Coco F, Ammatuna E, Noguera N. Treatment of acute promyelocytic leukemia with gemtuzumab ozogamicin. Clin Adv Hematol Oncol. 2006 Jan. 4(1):57-62, 76-7. [Medline]. Lo-Coco F, Cimino G, Breccia M, et al. Gemtuzumab ozogamicin (Mylotarg) as a single agent for molecularly relapsed acute promyelocytic leukemia. Blood. 2004 Oct 1. 104(7):1995-9. [Medline]. [Full Text]. Estey EH, Giles FJ, Beran M, et al. Experience with gemtuzumab ozogamycin ("Mylotarg") and all-trans retinoic acid in untreated acute promyelocytic leukemia. Blood. 2002 Jun 1. 99(11):4222-4. [Medline]. [Full Text]. de Botton S, Fawaz A, Chevret S, et al. Autologous and allogeneic stem-cell transplantation as salvage treatment of acute promyelocytic leukemia initially treated with all-trans-retinoic acid: a retrospective analysis of the European Acute Promyelocytic Leukemia Group. J Clin Oncol. 2005 Jan 1. 23(1):120-6. [Medline]. [Full Text]. Kharfan-Dabaja MA, Abou Mourad YR, Fernandez HF, Pasquini MC, Santos ES. Hematopoietic cell transplantation in acute promyelocytic leukemia: a comprehensive review. Biol Blood Marrow Transplant. 2007 Sep. 13(9):997-1004. [Medline]. Fenaux P, Chastang C, Chevret S, et al, for the European APL Group. A randomized comparison of all transretinoic acid (ATRA) followed by chemotherapy and ATRA plus chemotherapy and the role of maintenance therapy in newly diagnosed acute promyelocytic leukemia. Blood. 1999 Aug 15. 94(4):1192-200. [Medline]. [Full Text]. Sanz MA, Vellenga E, Rayon C, et al. All-trans retinoic acid and anthracycline monochemotherapy for the treatment of elderly patients with acute promyelocytic leukemia. Blood. 2004 Dec 1. 104(12):3490-3. [Medline]. [Full Text]. Lengfelder E, Hofmann WK, Nolte F. Management of elderly patients with acute promyelocytic leukemia: progress and problems. Ann Hematol. 2013 May 22. [Medline]. Braun T, Cereja S, Chevret S, Raffoux E, Beaumont M, Detourmignies L, et al. Evolving characteristics and outcome of secondary acute promyelocytic leukemia (APL): A prospective analysis by the French-Belgian-Swiss APL group. Cancer. 2015 Apr 6. [Medline]. Bone marrow aspirate hybridized with the RARA dual color break-apart probe set (Abbott-Vysis). The cell to the left shows a normal cell with 2 fusion signals, as the 5'RARA probe (orange) and the 3'RARA probe (green) are not separated. The cell on the right shows split signals for one RARA gene, indicating a chromosomal rearrangement disrupting the RARA gene. Image courtesy of Dr. Tina Edmonston from the Department of Pathology at Thomas Jefferson University Hospital. Bone marrow aspirate hybridized with PML/RARA dual color translocation probe set (Abbott-Vysis). The cell to the right shows a normal cell with 2 separate PML (orange) and RARA (green) signals each. The cell to the left shows an abnormal cell characterized by a single fusion signal juxtaposing the PML and RARA signals, suggestive of a translocation of the 2 genes. Images courtesy of Dr. Tina Edmonston from the Department of Pathology at Thomas Jefferson University Hospital.